Description A unique style physics game where you play as a ghost and have to possess pumpkins, avoid bats, trigger objects and use the environment to solve different puzzles. 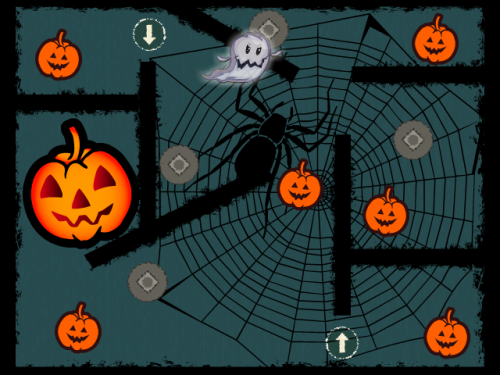 Click on pumpkins to possess them, you can then move them around the environment by using the arrow keys. The objective of the game is to get all of the little pumpkins to the massive pumpkin. There are dynamic worlds, dynamic objects, enemy bats and reverse gravity triggers to help you achieve victory. Arrows/wasd - Move the current possessed pumpkin. Space - Leave the current possessed pumpkin.